Rules, public skate times and sticks and pucks times will be decided by the rink-managing volunteers. 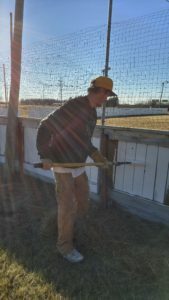 If you want to join the Kirkness Rink volunteers contact Rec Manager Dave Cain at recreation@rmofstclements.com. Where is Kirkness outdoor rink? It has been ten years since the Kirkness outdoor rink was in action. 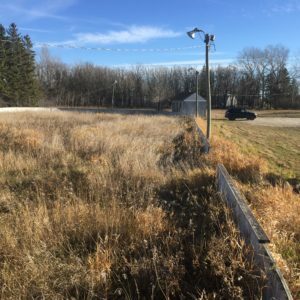 The sounds of skates on ice and pucks slamming off the boards will soon be heard again at this Olympic-sized outdoor rink, located just east of the cloverleaf at Hwy 59 and Hwy 44 off Hwy 44 in the RM of St. Clements. And it’s happening in record time. Local resident John Sagar approached the RM to resurrect the Kirkness outdoor rink on November 8. They connected with the RM of St. Clements Manager of Recreation and Leisure Services Dave Harcus on November 10. One hired worker, RM of St. Clements Public Works and several volunteers have worked non-stop since then, racing the clock to get the work done in the unseasonably warm weather before the snow flies. Five foot high grass and weeds were cut down, broken and rotten boards were replaced, and the boards and warming hut were given a fresh coat of paint. They are waiting for the power to be turned on so they can get the pump and the lights working. The RM will work with community volunteers to develop a year round maintenance and operation plan for the rink. “Everyone should take a drive by the rink. They may be amazed,” says Harcus.